River trips occur every Sunday throughout the year. We normally alternate between beginner and intermediate level trips, though this is subject to change. Our weekly emails will advise on the level of upcoming trips. On Tuesday and Thursday nights throughout the summer we make use of our facilities at Kirkstall. Tuesday nights are generally a "free" session with members able to practice what they like. Usually this will mean most people are down at the weir on the moving water. 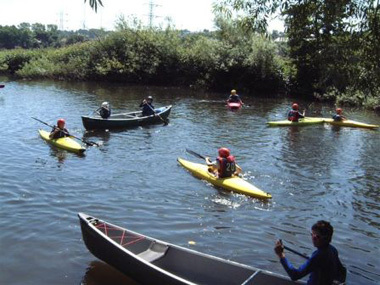 If you are a beginner, then you will be expected to go down to the weir with the instructors, unless one agrees to stay outside the boathouse with you on the flat water. Informal coaching will be given on moving water by the instructors who are present. No formal coaching will take place on a Tuesday night. Thursday evenings are our formal coaching evenings where the star test syllabi will be taught. This will include BCU 1-3 star flat water awards, and also an introduction to moving water down at the weir. Polo and slalom training sessions are also sometimes held at the river. The Club has a larger selection of boats and equipment which can be used during the Tuesday/Thursday night sessions. These sessions are primarily aimed at people wishing to progress onto river trips and weekends away. Please note that there is no charge for the river sessions, however you must be a paid up member to come on the river for insurance reasons.